Modi’s Victory What does it mean for Bangladesh? Narendra Modi’s win India’s parliamentary election by securing a single majority in thirty years, beating the ruling Congress party in a humiliating manner marks a major political shake in the political landscape not only in India but also in the whole South Asian region. Indian people have been so disillusioned for the last few decades. They want something new now and they have high hopes for Narendra Modi. The people of Bangladesh seems to be generally happy over Bharatiya Janata Party (BJP) led United Democratic Alliance’s (UDA) success in Delhi, though many are concerned about Modi’s anti-Muslim rhetoric during the campaign. The results show that it’s not the family pedigree that people are looking for; it’s authenticity in politics that they demand and it’s the ability to deliver which they trust. 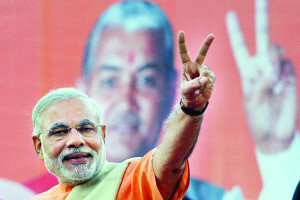 Modi rose to the leadership from being the chief minister of Gujarat. But he made it clear that his policy focus will encompass the entire region and going beyond. He has therefore invited the heads of government of all SARC countries in his inaugural function to steal the world’s attention. Responding to his expectations Pakistan Prime Minister Nowaz Sharif, Sri Lankan President Rajapakshey, Afghanistan President Hamid Karzai and the Prime Ministers of Nepal and Bhutan attended the event. All of them wanted a good beginning and a good start for the South Asia. Bangladesh was represented by Speaker of Jatiya Sangsad Dr Shirin Sharmin Chowdhury to the oath taking as Prime Minister Sheikh Hasina was on a visit to Tokyo which was pre-arranged before Modi’s inauguration was fixed. However, political observers tend to believe that the Bangladesh government could have sent a high profile team comprising some senior minister like Tofail Ahmed and Amir Hossain Amu to give an expression of political intent to work closely with the BJP government. The speaker is an apolitical person and remained similarly shunned in the sideline. Narendra Damodardas Modi orchestrated his election campaign with high precision and skill making direct interaction with an estimated 234 million people, travelling 300,000 kilometers, addressing 477 rallies and holding 5000 events to deliver his message of change to the 814 million strong electorate in the world’s largest democracy. Although he is considered India’s most controversial leader, he managed to create a personality cult in a Obama style primary in which he had no direct opponent. His campaign focused on the rural as well as the urban population uniting them in their desire for a better life. He crisscrossed the nation in a dazzling display of political support, gaining in the process increased recognition for himself and for his party. All these were engineered to facilitate the final push from March to May with the launching of the campaign slogan: “Abki Baar Modi Sarkar”. During the course of his campaign Modi developed a pattern of speech which appeals to the deepest sentiments of his audiences. He spoke about development, economic progress and the “Gujarat model”. The political journey of Narendra Modi is a kind of interesting thing to note. As a child, Modi helped his father and uncle at their tea stalls in their home state of Gujarat. From there he became an activist for the Rashtriya Swayamsevak Sangh – a right wing group that fathered the BJP. He rose through hard work, perseverance and organizational skill to become the chief minister of Gujarat. He has held the post through successive state elections since 2001. His well organized election campaign, funded by big businesses and based more on his personality than on the BJP’s stereotyped manifesto, has taken India by storm. After a decade of corrupt and dysfunctional Congress rule, a tea- seller’s son is in power swinging the doors open for the high office that has been so long kept reserved for the elite. Political analysts have been analyzing the impact on Bangladesh’s interests of Narendra Modi-led BJP government in India. They have been focusing on how the bilateral relation between the two neighboring countries will take shape in the coming days. This includes long pending issues like signing the Teesta water sharing agreement and ratification by Indian parliament the Land Boundary Agreement. Political analysts are not very optimistic about resolution of the crucial issues. It’s unlikely to be business as usual with New Delhi to relieve the AL’s sense of nervousness. It would also not mean new elections in Bangladesh to make the BNP happy. On balance though, Congress’ loss is a paradigm shift in the AL’s fortunes because unqualified and unquestioned support of New Delhi was one of the two major foundations of its strategy for holding on to power since the January 5 elections. The landslide has presented Modi with the luxury to become rude or generous, whatever deemed suitable, with others. Contrarily, Hasina, handicapped by deficiency in legitimacy, cannot afford to assert what a national leader should bargain for. The sweeping victory of Modi-led BJP and camp-follower NDP is, in the words of a former Bangladeshi diplomat, Ambassador Kazi Anwarul Masud, “a tectonic shift” in Indian politics potentially impacting on the whole of South Asia. Another former Bangladeshi diplomat, Ambassador SM Rashed Ahmed has pertinently asked a question: Can Bangladesh, in the “weak” state and “diseased” polity as obtaining now, expect any beneficial change by looking up to Delhi? He noted in an article in the Daily Star that the past years had been most disappointing phases of Bangladesh-India relationship by one-sided concessions with practically no significant reciprocity from India. The South Block may not be inclined to change the course as of now. But if our policy-makers go for renewed negotiations with India, based on linkages and reciprocity, we could see some positive forward movement. In the ultimate analysis, foreign policies are extensions of domestic policies. Instead of the change of guard in Delhi, our concern has to be with the weak state of the nation, failure of governance, near break-down of rule of law, growing intolerance for dissent, politicization of the vital organs of the state and government. Delhi is well aware of our weakness, particularly following the January 5 elections, with a polarized nation and the party in power lacking popular mandate. In other words, Ambassador Ahmed suggests that we have to put our own house in order ourselves before we can derive any benefit from change of guard in Delhi. The BNP is of course happy for very good reasons. The BNP was not fighting just the AL since January 2009 but also the Congress that had involved itself in Bangladesh’s politics as a stakeholder and senior partner of the Awami League. Its role in the January 5 elections was a major reason why the AL returned to power. The Congress-led government had vehemently supported the AL-led government in holding the one-sided and voter less parliamentary election on January 5 this year. Buoyed by the wholehearted support of the Congress-led government, the Sheikh Hasina-led government has successfully held the January 5 polls, keeping the BNP out of the elections. And immediately after formation of the new government-led by Hasina on January 12 evening, the then Congress-led government’s Prime Minister Manmohan Singh was the first leader who had called up Hasina to congratulate her on being sworn in as the prime minister. Monmohan also had sent Hasina a message of felicitation. He conveyed his good wishes and also “wished her and the people of Bangladesh all success in the endeavour to strengthen democratic institutions in Bangladesh”. If the Congress had supported “inclusive elections” like the western nations that was also the demand of the people of Bangladesh, the AL would have lost to the BNP just the way the Congress has lost to the BJP, winning 43 seats out of 542; its worst performance in history. In reviewing its Bangladesh policy, the BJP would no doubt see that the BNP has changed since it was in power last, particularly its publicly stated commitment for India’s security. The BJP would also not fail to see how the BNP has changed on the issue of land transit that the party has linked to reciprocity. The BJP would see the changes in the BNP as extremely positive for long-term relations with Bangladesh in the backdrop of the importance of Bangladesh to India’s critical national interests. Therefore, instead of pursuing India’s interests with a government in Bangladesh that has lost its credibility and legitimacy for which many in Bangladesh blame the Congress; the BJP would most likely wait to see how Bangladesh resolves these question before it shows inclination to do business as usual with Dhaka. On Immigration issue between the two countries, Modi is wrong on a few counts. The number of illegal migrants is exaggerated, and the absconding criminals are not infiltrators as they chose India as a safe haven. Hindus who migrated to India after 1947 would be excluded from the deportation drive as the BJP manifesto confirms. Now, Delhi should be told to take back more than 420,000 of the Indian nationals who are working illegally in Bangladesh (out of 500,000) and are sending money through dubious channels. Is it a matter of pride for a bigger country to have a smaller one as the fifth largest source of remittances in such a manner? India has been a beneficiary of smuggling that often instigates Bangladeshis being killed. Indian authorities should be ashamed of the factories manufacturing illicit drugs (ie phensidyl) near the border, to be smuggled into Bangladesh. There is no reason to expect that BJP would encourage the AL led government to hold new elections in Bangladesh as the BNP may be expecting. However, in developing relations, the BJP Government would no doubt review the way the Congress conducted these relations because there were just too many faults with it some contradicting India’s democratic beliefs. The BJP Government would in all likelihood wait and see how Bangladesh resolves its political problem and the issue of legitimacy that is hanging over the AL led government like the sword of Damocles. It would however not be encouraged to remove that sword but would like to wait for it to be gone before conducting long-term relations with Bangladesh. Bangladeshi Prime Minister’s offer to Modi to treat Bangladesh as his second home appears a ploy to win the heart and mind of the Indian leader to replace Awami League’s hitherto closer political ties with the Congress. Perhaps, she wants to switch sides now. There are many unknowns about Modi and it is hard to predict anything at this stage. Bangladesh faces tough diplomatic challenges in dealing with the Modi government. Finally, the two countries are destined to live next to each other.